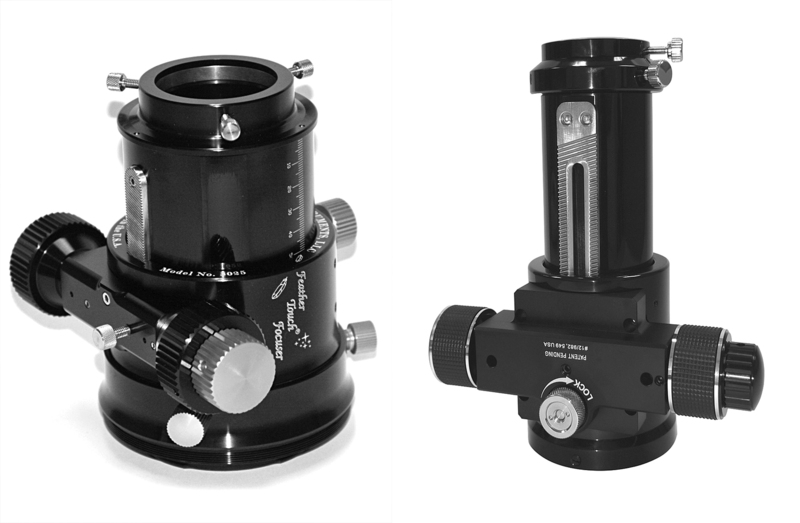 A focuser is always supplied as part of a telescope, but one might be purchased as an upgrade to the original focuser or for use with a Schmidt-Cassegrain telescope to allow fine focus to be achieved without the problem of image shift. These are not as common as they once were but can give a very smooth and backlash free movement that can work very well to accomplish the fine focusing of a CCD camera. Many have a scale around their edge which acts as a vernier to allow the very precise re-positioning of a CCD camera’s focus. There are two types, both being focused by the rotation of a ring as with a camera lens. With the simplest type the eyepiece or camera rotates as the focus is changed whilst in the more complex type the orientation of eyepiece or camera will not change. One excellent application is to add one to the rear of a Schmidt-Cassegrain telescope. Approximate focus is obtained by movement of the primary mirror and then the precise focus is reached with the use of the helical focuser. The important point is that this is then achieved without any annoying image shift that can be real problem when using a small CCD sensor. Helical focusers are available from Hutech/Borg and Teleskop-Service amongst others. A good feature of helical focusers is that the focus will not ‘creep’ if supporting a heavy CCD camera. The image below shows the Borg Helical Focuser, ideal for use with a Schmidt-Cassegrain telescope. 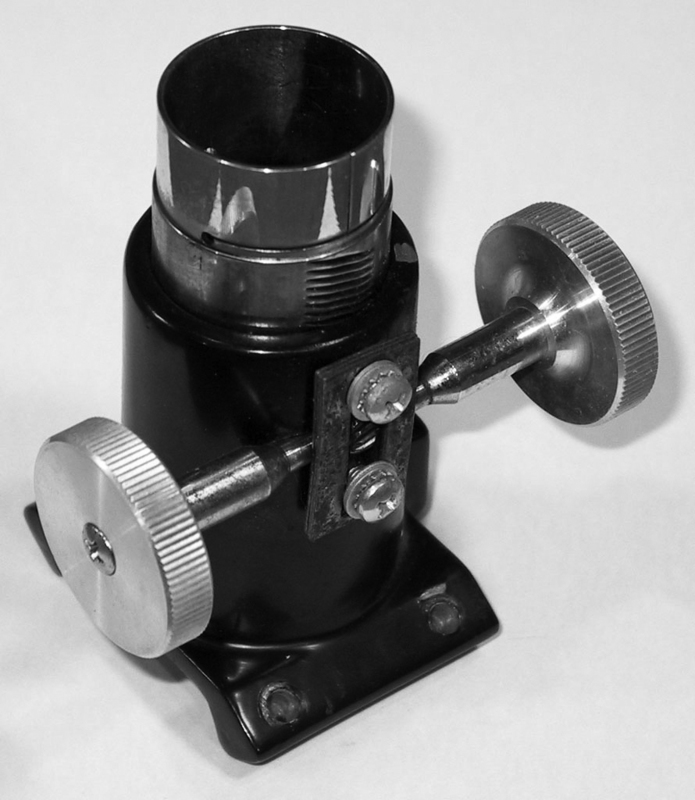 A clever thought – a free helical focuser! Alan Heath has passed onto me his very simple ‘fine focus’ procedure. 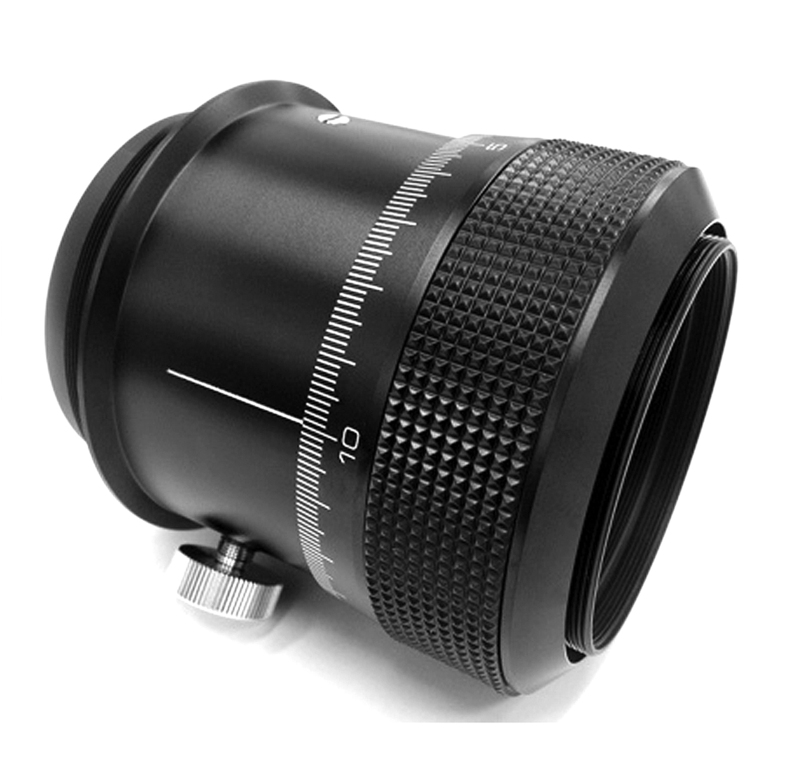 An eyepiece is normally screwed into the tube which is inserted into the focuser barrel. If it is unscrewed by half a turn or so, then very fine focus can be achieved by slight rotation of the eyepiece. This is, in effect, adding a helical focuser to easily achieve the best possible focus. Brilliant! Simple rack and pinion focusers, such as that shown below, used to be very common and can still be found on Newtonian telescopes. However, as we will see, in an enhanced ‘helical’ form these are now becoming the norm for refractors intended for use in astroimaging as they will not creep as might a Crayford focuser when supporting the weight of a CCD camera and accessories − particularly when imaging at high elevations. The standard rack-and-pinion focuser is a simple design and works well for visual applications. However, inexpensive versions can suffer from stiffness, excessive play and backlash. Stiffness can result from the gear and teeth of the rack-and-pinion system being engaged too tightly, or from poor quality grease having been applied to lubricate the system. The tightness can often be adjusted and the grease replaced. A poor fit between the drawtube and outer walls of the focuser can result in excessive play which can cause the image in the eyepiece to shift as the focus is racked in and out making precise focus very difficult. Some backlash is inherent in the design as otherwise the gears would bind so even good quality focusers can suffer somewhat as a result. However, some of the world’s best telescopes use linear rack and pinion focusers made to very high standards such as those found with Takahashi Refractors. Starlight Instruments and some other companies offer very high quality focusers using a very fine pitch helical rack and pinion that has the teeth of the rack and pinion cut at an angle. As several teeth are in simultaneous contact, extremely fine tolerances required and so these are expensive to produce. The reward is that these focusers, with two examples shown below, provide a very smooth movement with significantly reduced backlash and will not creep. Helical rack and pinion focusers are now replacing Crayford focusers on many of good quality refractors. For many years, these have been the most common type of focuser, being found on virtually all refractors but are now tending to be replaced by helical rack and pinion focusers. The Crayford focuser was invented by John Wall, a member of the Crayford Manor House Astronomical Society, who named it after his society and decided not to patent the idea. The design is similar in appearance to a Rack and pinion focuser, but employs no teeth. 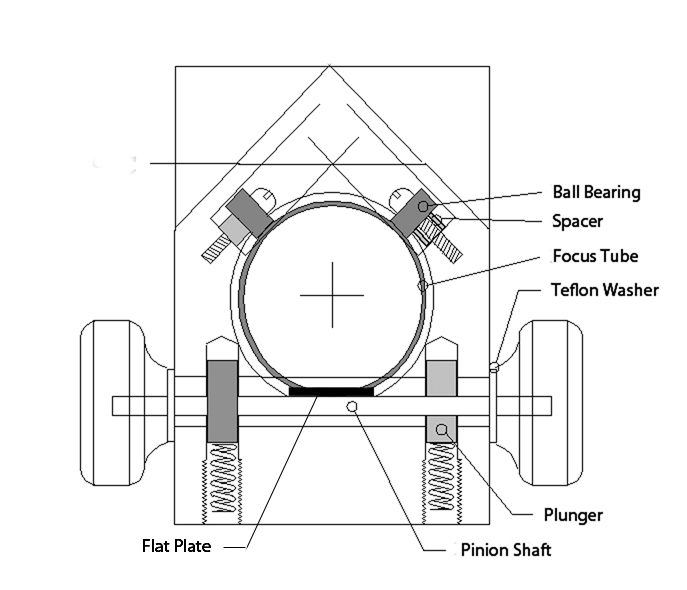 Instead, a round axle is pressed against a flat plate on the side of the focuser drawtube relying solely on friction to move the drawtube as the axle is turned. As shown in the figure below, the opposite side of the drawtube is pressed against a set of ball or roller bearings against which it can move smoothly with very low friction. The pressure applied by the axle can be adjusted for smoothest operation and, once focus is found, the drawtube may be locked in position to support heavy eyepieces or cameras. Crayford focusers can be used, as with helical focusers, to minimise the image shift found with Schmidt-Cassegrain telescopes. 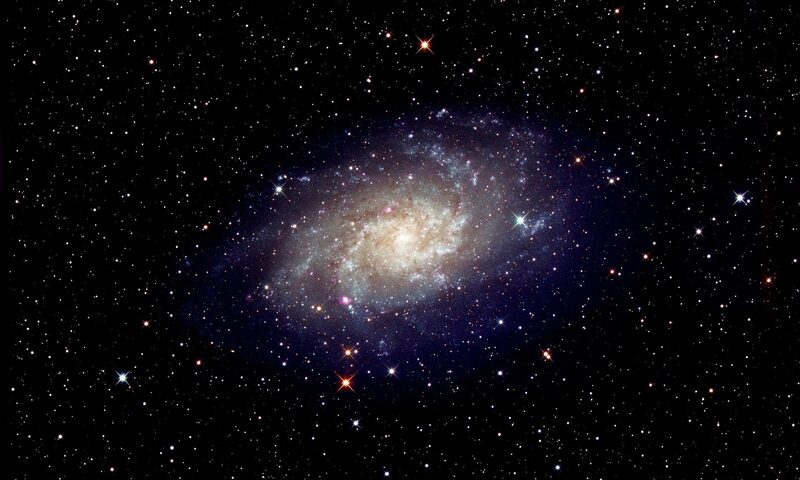 Very high quality versions are produced by Moonlight Telescope Accessories and Starlight Instruments. Some telescopes, as some Coronado and Lunt H-alpha telescopes, use a two-stage focusing system. First a tube lying within the focuser is extended and then locked to find approximate focus. Then a fine focuser (which should be set in its mid-range position as the extension tube is adjusted) is used to give fine focus. When imaging, a lightweight ‘webcam’ type camera is likely to be used, so a Crayford focuser is unlikely to creep when in use. Originally, most focusers had a barrel diameter of 1.25 inches but this, of course, limits the maximum possible field stop in an eyepiece to ~27 mm. However, as wide field eyepieces have become available, this would be a severe limitation on the possible apparent field of view. To avoid this problem, virtually all focusers now have a 2 inch barrel which allows a maximum field stop diameter of over 40 mm – so that a wide field eyepiece could observe over twice the area of sky. Focusers are available with even wider barrels and these are for use when astroimaging with large sized sensors in order to avoid vignetting in the corners of the frame.